Ok, so I've hit a few towns in my crusade to cover as broad a path of NEPA as I can in a short time, but I hadn't yet been to "the big city" aka downtown scranton for a review. 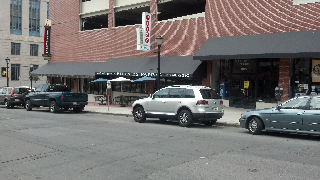 I also hadn't reviewed a pan pizza yet, so I thought it would be good to head to the long-established Pizza By Pappas on the square. I ordered a 10" pizza with pepperoni. 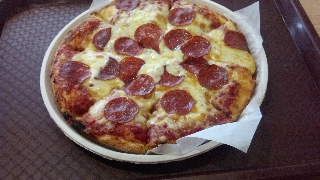 Anyone who loves pizza knows that adding pepperoni means adding grease. Anyone who knows pappas pizza knows that it's greasy! For the big eaters (including myself) this could be considered a personal pizza, but it could be enough to for 2 to dine on. The trademark small pizza looked very familiar to me as Pappas tends to have a highly consistent product. At first glance, it appeared to be cooked almost perfectly, however the bottom of the pizza was a little soft for my taste, and could have been crispier. The thickness of the crust is not quite a deep dish, but it's certainly thicker than a New York Style. The outer ridge of the crust was my favorite part, as it was very crispy, and the cheese was spread a little further from the crust, so it was like eating a mini cheesy bread that tasted like a "Cheese-It". I'm assuming the Cheese-It flavor comes from some blend of cheeses including cheddar, which is another source of the grease. When faced with the grease problem, some people are blotters who reach for the napkin and soak up the grease, but I'm not among them. I consume whatever biproducts the pie has to offer, and enjoy a greasy pizza from time to time. Some people claim it's even a good hangover medicine, but take that for what it's worth. Back to the pepperroni, the grease essentially deep fried the roni while it was baking in the oven which created an incredible flavor and crispness. Although, I'm sure my arteries will probably hate me for eating all the oily substance. 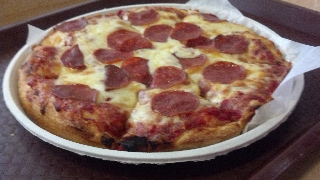 The sauce was relatively flavorful and slightly sweet which is a decent complement to the salty pepperoni and cheese. 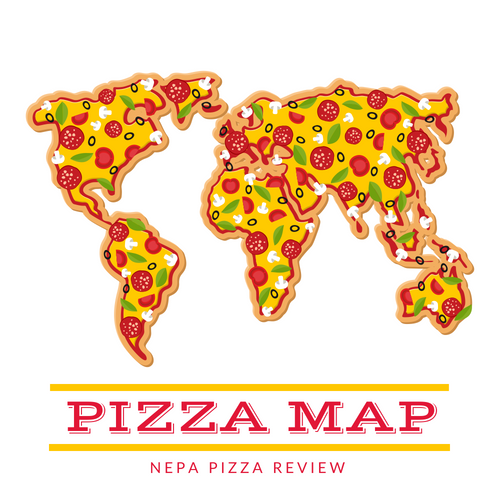 The pizza overall is well balanced and is a nice change of pace from traditional NY style or old forge pizzas in the area. It reminds me of a higher quality, better tasting, less preserved, and thinner Pizza Hut deep dish pie. THE BOTTOM LINE: This is the type of pizza I'm good with consuming once a year or once every couple of years. It's certainly not a "must-have" on my pizza list, and thank goodness for that because if I consumed that much grease on a frequent basis, I'd be in much poorer health. I know some people who love this pizza and swear by it, but I know many more people who say, "too much grease" and I'd have to say I'm in the ladder group.